This consultation ended on December 31, 2017. The current consultation can be found at this link. GoodWeave is field testing the applicability of the existing GoodWeave Standard principles and requirements in new sectors including apparel and textile supply chains, with a specific focus on informal home-based production. As part of this standard development process, we welcome feedback from all interested parties on the draft standard. 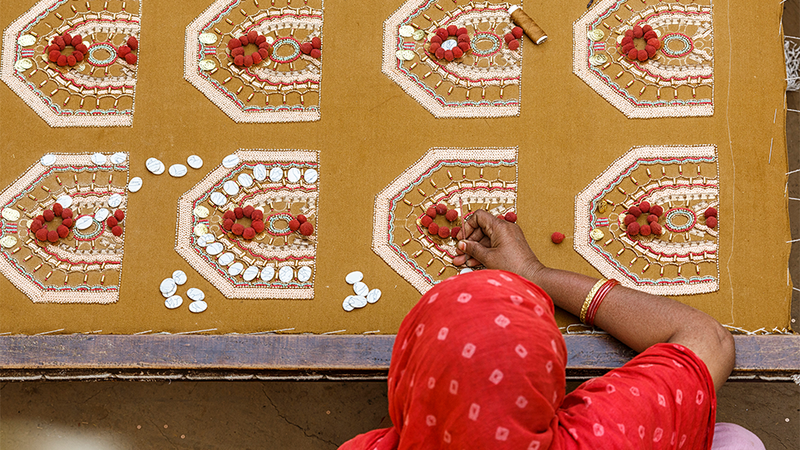 GoodWeave’s new project is a two-year pilot in northern India to establish and test a new sourcing system, which will tackle child and forced labor in informal embellished apparel, fashion jewelry and home textiles supply chains, especially at the homeworker level. The approach establishes and monitors strict labor standards and requires suppliers to meet these requirements at all tiers of production down to home workers. GoodWeave will also work closely with communities to offer child protection and educational opportunities. The pilot includes apparel and textile producers in five communities reaching and supporting 7,500 homeworkers and 6,000 children. In 2017, GoodWeave is field testing the applicability of the existing GoodWeave Standard principles and requirements in apparel and textile supply chains, with a specific focus on informal home-based production. A draft Standard has been adapted for these sectors, with targeted requirements to the different actors in the supply chain. While there are a wide range of efforts to improve conditions, and prevent child labor in apparel factories, most do not reach the significant worker abuses in subcontracted, decentralized tiers, including the homeworkers making embellished garments, fashion jewelry, and home textiles. GoodWeave’s approach is designed to avoid duplicating the work of others by focusing on filling gaps in the coverage of existing compliance standards, predominantly with informal workers in these decentralized and subcontracted tiers of production. As part of this standard development process, all interested parties are invited to take part in two rounds of public consultation. Below, you will find an overview of the consultation, which includes project timelines as well as a summary of changes incorporated into the draft Standard as a result of stakeholder feedback. The full text of the new, adapted Standard is also available below, as well as a consolidated report of all comments collected during the first consultation period. Feedback on the Standard can be submitted through December 31, 2017. Please note that there are no proposed changes to the existing GoodWeave Standard for Rug Producers in this consultation. Feedback will be considered by the GoodWeave Standards Committee in preparing the final draft of the Standard. Please contact Comments@GoodWeave.org if you have any questions about the new draft Standard or consultation process.